Intrepid expedition reporter Artem Zagorodnov critiques Russia’s eastern road system and lives to tell the tale. It has been intense driving day and night (over 700 miles since our nap for two hours in the middle of the night at a gas station parking lot), so I feel it's an appropriate time to comment on the state of Russian roads. I suppose it’s most important to note that all of the roads we have taken (apart from very isolated tracks to abandoned villages) have been paved. 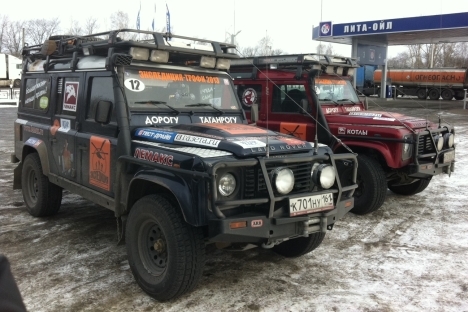 Apparently this will be the case all the way to Vladivostok, so that will be easier on the car’s shocks and our spines. Secondly, the highways have gotten wider since I last took this route in 2006. Most of the federal roads ("interstates") have two lanes going in each direction so you can pass slow traffic and this makes a huge difference. However, the highways still serve as the main road through many towns along the way, rather than bypass them. This means a slow entry and exit into and out of each village center, bringing traffic down to a speed of at best 30 miles per hour on a regular basis. The roads are still horribly overcrowded with both trucks and car traffic. From what I've read, Russia has done nowhere near as well as China has in responding to surging car ownership rates. Traffic jams are common, as are deadly accidents. We've witnessed the consequences of several horror shows as they were being cleaned up. All in all, you can still never be too certain about how long it will take you to reach somewhere. What’s the upside of the past 24 hours spent staring at oncoming traffic, hoping the road God stays in my lane? The long time spent in the car has also been a catalyst for getting to know my fellow travelers. The driving responsibilities are split between Anton and Evgeny: Anton, 29, travels around Russia and nearby countries to give training seminars at the company's licensed dealers; he loves to drive. Evgeny is much older, the proud and sage general director of Lemax. Dasha, who is responsible for sales and advertising at Lemax, sits in the passenger seat and handles all the navigation. Armed only with a laptop, she also does research (like how we are supposed to find this damn rocket) and scans sources of information about the trip or competitors. Inna, Peter and Vadim, also Lemax employees, travel in the other car alongside us. I haven’t had the opportunity to get to know them too well yet. Despite the close quarters, team spirit remains high and I feel lucky to be in the company of such a positive group of people. Lemax celebrated its 20th anniversary last year and instead of the traditional boozing common on such occasions in many Russian organizations, they organized a series of extreme sports competitions (20 in total). These included everything from skydiving to biking to driving to Lake Baikal. Only the best competitors from those team-building events were allowed to compete in this Expedition, so they are all enthusiastic.